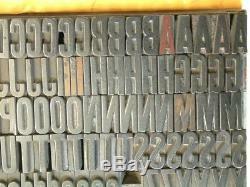 Offered: Vintage Condensed Gothic wood type, 6 Pica Line (approximate 1 inch tall letter height). Font has no manufacture's mark. Offering is a sizable 235 piece font which includes Caps, lower case letters, ligatures ff, fi, fl. Ffi & ffl, figures plus punctuation. Please see chart below for more information on font letter distribution offered; chart includes character count for entire font: Cap letters, lower case, figures & punctuation. As mentioned above this offering has no manufactures markings. Unfortunately there were wood type manufactures that did not identify their company on the Cap A as was the practice for most of the notable wood type manufactures that printers are familiar with Hamilton, Tubbs, Page, American Wood Type to name a few. This offering would make a very nice addition if you have been considering adding wood type to your shop inventory. This is a small enough size (one inch tall) plus being a condensed face you are not restricted from using this on smaller sized platen presses. 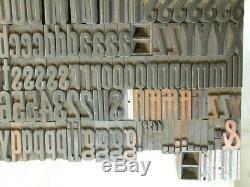 Ou could easily accommodate use of this font with a table top press. Most wood type has a fair share of wear to the edges as well as dings in the type face that occur through the years or as some like to call it "patina". There are a few letters that have dings and or have wood removed from individual letters for tighter letter spacing. This is a somewhat common finding on older fonts of wood type. Please carefully view all photos included with this offering for acceptability to your needs. This font was photographed on a 12 x 18 steel galley for reference as to size of this font offering. Metal Galley is not included in this offering. I've noticed after assembling all the photos and information pertaining to this font that there are two wrong font numbers in the mix, one figure 9 and one figure 0 are not same as font offered. They are a bolder w/thicker lines. (close but not same font) I have removed those two figures from the figure count as well as the total pieces included count shown below, both figures will however be included however, should you choose to use them in a pinch. A - 5 B - 4 C - 5 D - 3 E - 8 F - 4 G - 4 H - 5 I - 5. J - 4 K - 3 L - 8 M - 4 N - 5 O - 4 P - 5 Q - 2 R - 4. S - 9 T - 7 U - 4 V - 3 W - 4 X - 1 Y - 3 Z - 2. Total cap letters included: 116 pieces. A - 4 b - 3 c - 3 d - 3 e - 3 f - 3 g - 4 h - 3 i - 4. J - 2 k - 2 l - 3 m - 2 n - 4 o - 4 p - 3 q - 2 r - 3. S - 5 t - 4 u - 3 v - 3 w - 3 x - 2 y - 3 z - 2. Total lower case letters included: 80 pieces. Ff - 1 fi - 1 fl - 1 ffi - 1 ffl - 1. Total lower case ligatures included: 5 pieces. 1 - 3 2 - 2 3 - 1 4 - 1 5 - 2 6 - 1 7 - 1 8 - 2 9 - 0. Total figures included: 17 pieces. Figures 6 & 9 can be inverted to form opposite figure. 4, Comma (,) 2, Open /Quote (') 2. Apostrophe /Close quote (') 2, Ampersand (&) 2, Exclamation Mark! Additional notes on above inventory. This offering includes 116 Cap letters, 85 lower case letters includes l.
Ligatures, 19 Figures (Numerals) and 17 punctuation. Also included is a liberal amount of spacing material (6 point lead slugs as well as 2 point leads all cut to a length of 6 picas). Please do not hesitate to contact me if you have any questions in regards to this offering. 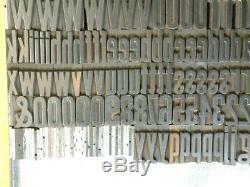 The item "6 line Condensed Gothic Letterpress Wood Type Caps, l. 235 pcs freeSHIP" is in sale since Wednesday, December 06, 2017. This item is in the category "Business & Industrial\Printing & Graphic Arts\Printing & Graphic Essentials\Type, Cuts & Printing Blocks". 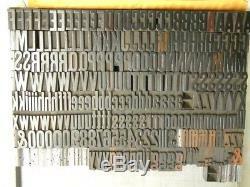 The seller is "pjletterpress" and is located in Waterford, Pennsylvania. This item can be shipped to United States, Canada, United Kingdom, Denmark, Romania, Slovakia, Bulgaria, Czech republic, Finland, Hungary, Latvia, Lithuania, Malta, Estonia, Australia, Greece, Portugal, Cyprus, Slovenia, Japan, China, Sweden, South Korea, Indonesia, Taiwan, Thailand, Belgium, France, Hong Kong, Ireland, Netherlands, Poland, Spain, Italy, Germany, Austria, Israel, Mexico, New Zealand, Singapore, Switzerland, Norway, Saudi arabia, Ukraine, United arab emirates, Qatar, Kuwait, Bahrain, Croatia, Malaysia. 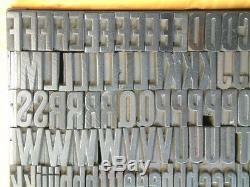 Brand: unknown Wood Type mfg.